Thobe is a favorite traditional dress that provides an unique identity to Muslim men. Thobes are also called Dishdasha, Suriyah or Kandura in different parts of the world. 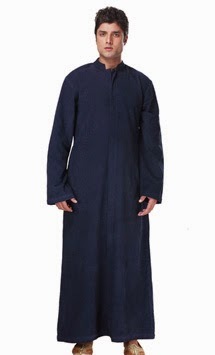 One can avail thobes in varied lengths depending on his requirement. The short thobes are a symbol of modesty. On the other hand, long thobes exhibit royalty and elite status of the wearer. The most preferred fabric used for designing a thobe is cotton. Woolen material is also used for designing Islamic thobes for men, that are worn by men during the winter season. Apart from cotton and wool, thobes are also designed using georgette, polyester and other light fabrics. Lighter fabric thobes are comparatively casual in terms of look. These are normally worn by the wearers on a daily basis. Men in different Islamic countries wear thobes in their own typical style. These full-length apparels offer versatility to the wearer. An Islamic thobe for men can be made using both embroidered as well as printed fabric. The most striking feature of a thobe is its sparkling embroidery around the neck and the cuffs. Some formal thobes come with sequins that give a special look to the garment. Formal thobes are a little expensive and are thus worn by rich men on special occasions like wedding, Eid etc. One can distinguish a thobe style on the basis of its design and cut.